In the run-up to the June 12 summit between President Trump and North Korean Leader Kim Jong Un there has been no shortage of debate and analysis. But a recent forum of scholars, parliamentarians and prominent civil society figures held in Mongolia on Korean Unification offered some new perspectives on the Korean crisis and prospects for its ultimate resolution. Participants called for the launch of a process that leads to the peaceful reunification of the Korean people, thereby addressing the root issues of the 70-year division between North and South that had led to war and continuing tensions. While security issues provide the impetus to start the process, speakers noted that the historic aspiration of the Korean people embodied in the 1919 Korean independence movement could serve as a foundation and guide for the peaceful unification process to be pursued simultaneously. It should also be Korean-led but requires the support of regional powers and international bodies like the UN for progress to be made. Another key theme was the growing strategic role of Mongolia in Northeast Asia. Speakers noted that Mongolia and North Korea had started in similar situations when the collapse of the Soviet Union ended their subsidies but had followed “markedly different” paths since. Mongolia chose a democratic course, and its citizens enjoyed responsive governance and basic human rights as well as growing prosperity. It provides a bright example for a course that could also be taken by North Korea’s leadership. Mongolia is also nuclear-free despite its two nuclear-armed neighbors; in this respect, too, it offers an alternative to North Korea. It is “a state with internationally recognized nuclear-weapon-free status that benefits from the political assurances of the five recognized nuclear-weapon states. 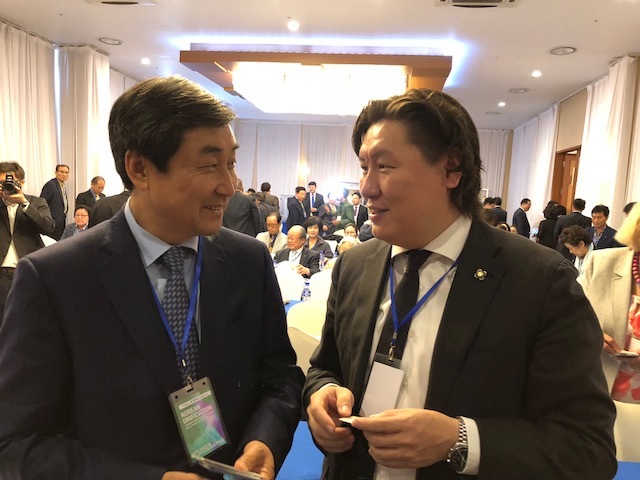 Hence, Mongolia is well positioned to play a unique role as provider of international good offices, of political space and venue for international meetings and consultations,” said conference organizer Dr. J. Enkhsaikhan, former Mongolian Ambassador to the United Nations and chairman of the Blue Banner NGO. Mongolia has played a significant but often unrecognized role in Korean peninsula issues through the track 1.5 “Ulaanbaatar Dialogue” held for the past four years to discuss issues on Northeast Asian security and economic cooperation and development. The Mongolian conference was the first in a series of Asian events to bring regional attention and support to the centenary. Further conferences will be held in Japan, Uganda, and India in the run-up to a Global Peace Convention and One Korea concert on March 1, 2019 celebrating the centennial of the Korean independence movement as a catalyst for peaceful unification. The conference was organized by Global Peace Foundation, EastWest Institute, and One Korea Foundation, all based in the USA; Action for Korea United, based in South Korea; and Blue Banner, and the Mongolian Forum for Korean Unification, based in Mongolia. It was supported by the Ministry of Foreign Affairs of Mongolia and included scholars from Korea, Russia, China, Mongolia and the United States.